There really isn’t much to be added about Friday night. Every watching Rovers fan will be in agreement that it was another famous night for the Hoops, and a return to the sort of interest, passion and intensity that made last year’s side title challengers, and will make this side one too. Unlike Bohs previous two trips to Tallaght, Shamrock Rovers were not fortunate winners, we fully deserved three points having comfortably outplayed the northsiders and league favourites. If France can have Le Crunch, I can’t see why Dublin can’t have “De Crunch”. Tomorrow night is the big one, as Rovers try to get their season up and running against the Champions. The crash barriers are being put up around the stadium already, RTÉ are knocking up a commentary studio by the Square end and the tickets are flying off the shelves as a crowd of 6,000 is again expected. The big question is can we win it. Yes, we can, but it’ll require a huge effort and a lot of luck. If Rovers were at full strength and playing well this would still be an uphill task against the two times league winners. Rovers have certainly not been playing well, and are a million miles away from being at full strength. Rovers absentee-list is staggering. Gary Twigg (calf), Dessie Baker (broken arm), Pat Sullivan (knee), Stephen Bradley (wrist), Paddy Kavanagh (hamstring), Pat Flynn (hip), Craig Sives (calf) and Sean O’Connor (knee) may all miss out tomorrow. With that sort of injury crisis we shouldn’t have a chance. In particular missing both of our first choice strikers, missing all three right backs will lead to a lot of re-jigging to the whole team. It’s not easy to guess what sort of side we’ll put out, there are too many variables. Chambers may be re-deployed from support striker on Monday to right back on Friday. Expect Tommie Stewart to make way for Graham Barrett up front if we go with one up top as we did on Monday, with the injury crisis we may need the extra body in the middle for protection that 4-5-1 offers. Last year Gary Twigg was very much the hero in this fixture, but what are the chances of him playing Friday? There’s no chance of him starting the game, he’s been out too long and only resumed kicking a ball this week. MON has suggested in the press that he wont be named on the bench either, but I fully expect to see him in the match-day squad. 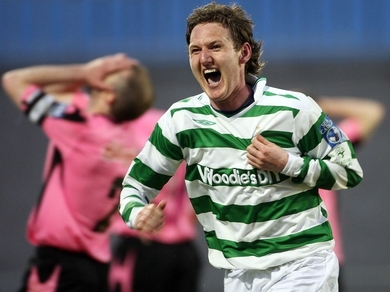 Even if only 70% fit, naming Twigg amongst the subs will give the whole crowd a huge lift on Friday night, Bohs will worry about facing him again, and the players will feed off the confidence of the Hoops and fear of the Gypsy’s. He’s unlikely to offer us much on the field due to his fitness, but psychologically he could give a huge boost to a struggling side. If MON’s M.O. in the press should be to play down the chances of Twigg playing, I’d also like to see him highlight the behaviour of human Rat, Pat Fenlon. Right from the first day of the season Liam Buckley pointed out the unsporting behaviour from Fenlon in constantly interfering with the referee and linesman. It was no surprise they got a ridiculous penalty that night. Against Drogheda they played against 9 men. Against Sligo they played against 10. Against Linfield another opposition player was sent off. Against Pats on Tuesday Bohs were handed no such advantage, presumably what Fenlon was complaining about in the picture above at half-time. Fenlon can’t be allowed to influence Alan Kelly tomorrow night the way he has put pressure on officials in other games. Bohs’ (other) Murphy is the best diver in the League and will be out to win a few penalties or dangerous free-kicks for Killian Brennan around our area. By highlighting it before the game MON, or the Rovers players can ensure Kelly doesn’t rush in to making a big decision. Just look at how Mike Dean was influenced by paper talk before the recent Man Utd – Chelsea game. Dean was highlighted as being penalty-happy, so much so that during the game he turned down 3 clear spot-kicks. 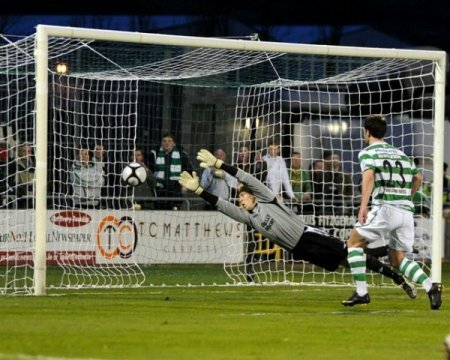 We can expect Bohs tactics to be much as they were when they came to Tallaght last October. It won’t make for a great game. They’ll try to dominate midfield by flooding it with bodies, and preventing us from getting the ball wide. Their main source of attack that night was constantly trying to release Paddy Madden with balls over the top to take advantage of the youngster’s pace. In the intervening few months Bohs have added another quick striker, super-ego Raf Cretaro and we’ve added Dan Murray who isn’t exactly the most nimble centre half. Bohs will try to take advantage big time, and Rovers are going to be forced to defend further back because of it. This is where we could be caught out badly, without three right backs we may be left to field Murphy out of position on the right and the dodgy looking Enda Stevens at left-back. Bohs weren’t able to capitalise last year against Sives, Price, Bermingham and Sullivan. They’ll like their chances of releasing Madden/Cretaro a lot more against Murray, Price, out-of-position Murphy and Enda Stevens. Hopefully at least some of the above players can pass late fitness tests and help flesh out the bare bones that is our squad. There’s still the faint possibility that Twigg could come off the bench after 80 minutes to score yet another famous Hoops goal, to give us 3 points which would put us right back in the title hunt. A draw would be no disaster though and allow us to tread water until reinforcements arrive in a few weeks as the injuries ease off. Eitehr way, it’s going to be very, very nervy. The two games over the Easter weekend won’t live long in the memory of any Hoops fan, a tally of two points against the two newly promoted teams doesn’t scream title-challenge, though the Fingal game offered much more hope of a recovery than a tepid game with UCD. That was a little more like it. After two disastrous performances Rovers rebounded to dig out their first win of the season, showing glimpses of improvement and a road back to last year’s form. The win was marred by a potentially serious injury to goalscorer Pat Sullivan as the injuries continue to add up for the Hoops. After the terrible performances in the previous two games it was important to grind out a win tonight, in whatever fashion we could. Coming from such a low point before the game Rovers were never going to come out and thrash a decent Galway side, instead it was always going to be about restoring confidence and slowly working towards improving on the awfulness of the Pats and Dundalk games. The catalyst to the improvement was certainly Sean O’Connor who sparked Rovers to life, and for the first time this season injected a bit of creativity in to Rovers causing problems for the opposition. SOC’s set-piece delivery tonight was first class, providing a wonderful assist for Sullivan’s goal after setting up Dennehy from a similar chance moments earlier. SOC was the clear MotM, also producing a wonderful free-kick in the second half well saved by Barry Ryan and testing the keeper again at another opportunity. Finally a bit of creativity, SOC has earned his place in the team for next week against UCD. Apart from him though the other forward players again didn’t penetrate as we might have hoped. Dennehy has seen a lot of possession in the opening 4 games, and undoubtedly works hard but in all that time hasn’t really skinned a full back, set up a good opportunity for a teammate or finished off a chance. Graham Barrett produced another tireless display up front, but for all his harrying and annoying defenders he lacked another option up front with him to take full advantage. If Barrett can keep up this form Gary Twigg will surely reap the benefits of his hard work on his return (which Tony O’Donoghue suggested could be sooner than we thought on last week’s LoI Podcast). Barrett still hasn’t had a goalscoring opportunity laid off for him in 4 games, but that’s not his fault or through lack of effort. Still, he gets stick from his own fans who fail to see his role in the team, with a lot of people preferring someone who does pretty much nothing for 90 minutes but will score a tap in once every 5 games. Barrett is so much more of a handful than Amond and is a far better team option, even though Amond will score more goals than Graham due to their respective roles. Elsewhere Stephen Rice was a little more involved, though again not up to last year’s form. Hopefully he’s on the road back there though. Beside him Bayly produced another solid performance, with a lovely first half effort well stopped by Barry Ryan. Although he looks a decent player, Bayly’s temperament is a serious problem and makes him far less of an asset than he might otherwise be. Another bad tackle last night after he should have been sent off last week against Dundalk. Someone needs to have a word with him before the Bohs derby. If he plays in that he’s liable to get himself sent off after 15 minutes and leave his teammates up against it. At the back Sullivan was stretchered off with a bad looking leg injury which could see him out for some time. Another injury headache for MON to deal with, any chances of getting a settled back 4 after the turbulent off-season has been thrown out the window due to injuries and suspensions so it’s not surprising the slow start we’ve made. Not helping either is the form of Dan Murray. Murray looked better today than in previous games, and delivered one fantastic cross field ball from the centre half position, but a moment of madness should have cost us dearly as he attempted a ridiculous back header that he missed completely. What he was thinking I’ve no idea, had he touched it it would have had the exact same result and left the Galway man through on goal. In goal Alan Mannus continued his decent start to the season, looking commanding, catching all thrown at him, and making one fantastic stop in the second half. Like Barrett he’s come under fire from his own fans at home, but he’s had little chance with any goal we’ve conceded this season (he was wrongly blamed for the second against Galway, though it took a deflection taking the ball right in to the corner of the net). Enda Stevens also put in a decent shift but doesn’t seem to offer much going forward and seems a little lightweight. The jury is definitely still out on the ex-Pats man. So a first three points of the season and a better starting point to begin putting things right. With Bohs dropping points against Sligo (a fourth poorish performance from four for them, we’re not the only ones struggling) we’re only six points off the top with the whole season to play. The doom and gloom merchants love a good crisis to turn on the management/team but with players returning from injury, suspension and the potential addition of Thomas Stewart and Chris Turner next week there doesn’t seem reason to panic just yet. Rovers produced their worst display of the Michael O’Neill reign as they crashed to a pitifully tame defeat at home to a well drilled but uninspiring Pat’s team. It was without doubt the worst night at Tallaght Stadium so far when the wind again destroyed any chance of a football game, and leaves an awful lot of questions to be asked about this Rovers team. To cap things off the mentalist above managed to get on to the pitch, push Pat’s keeper and try to punch another player while security and Gardaí looked on from afar. Where do you begin wrapping up a night like that…. Change of Plans; Bayly in! Turner out? It now appears Rovers are not going to hang around for Chris Turner, and have swooped instead for Robert Bayly. Shamrock Rovers have completed the signing of former Cherry Orchard, Leeds United and Sporting Fingal player Robert Bayly. The 22-year-old – an attacking midfielder and nephew of former Hoop, Richie Bayly – has agreed a one-year deal and if cleared in time could feature in the squad for tomorrow’s (March 16th) game against St Patrick’s Athletic at Tallaght Stadium.